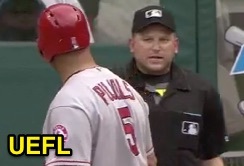 HP Umpire Clint Fagan ejected Angels DH Albert Pujols for arguing a strike three call in the top of the 8th inning of the Angels-Indians game. With two out and none on, Pujols took a 2-2 fastball from Indians pitcher Andrew Miller for a called third strike. Replays indicate the pitch was located over the inner edge of home plate and knee high (px -.716, pz 1.801 [sz_bot 1.580]) and all other eligible pitches during the at-bat were properly officiated, the call was correct. * At the time of the ejection, the Indians were leading, 5-4. The Indians ultimately won the contest, 5-4. This is Clint Fagan (82)'s first ejection of the 2016 MLB regular season. Clint Fagan now has 2 points in the UEFL Standings (-3 Previous + 3 AAA + 2 Correct Call = 2). Crew Chief Larry Vanover now has 9 points in Crew Division (8 Previous + 1 Correct Call = 9). *The 2-0 pitch ruled strike one is not eligible for consideration pursuant to UEFL Rule 6-5-c-5-c. This is the 135th ejection report of the 2016 regular season. This is the 65th player ejection of 2016. Prior to ejection, Pujols was 0-4 (SO) in the contest. This is LA-Anaheim's 5th ejection of 2016, T-2nd in the AL West (HOU 6; LAA, OAK 5; TEX 4; SEA 1). This is Albert Pujols' first ejection since August 21, 2014 (Andy Fletcher; QOC = U [K2/DiMuro]). This is Clint Fagan's first ejection since May 23, 2015 (Justin Upton; QOC = Y [Balls/Strikes]). Wrap: Los Angeles Angels vs. Cleveland Indians, 8/14/16 | Video available via "Read more"